January in Toronto may be cold and dark, but fun activities for visitors are around every corner. Ring in the new year and banish the winter blues with these top picks for events this month. Check out the full calendar here. Toronto’s ultimate food festival, Winterlicious is the perfect opportunity to explore the city’s unique culinary scene. More than two hundred of Toronto’s top restaurants will offer three-course prix fixe menus for lunch or dinner. Offering everything from Italian, Thai, and Iranian cuisine to contemporary Canadian comfort food, Winterlicious is a great chance to experience the cultural diversity of this international city. 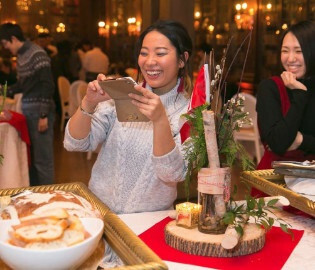 For even more delicious experiences, check out Winterlicious’ Culinary Event Series, featuring seven one-of-a-kind cooking and dining experience hosted by Toronto’s top venues and chefs. Learn about the art of Italian baking, enjoy high tea at Casa Loma, or take a historic culinary journey through the Distillery District. Ice skating opportunities abound in Toronto during the winter, but there is nothing quite like DJ Skate Nights at Harbourfront Centre’s Natrel Rink. Be a part of Toronto’s weekly “block party on ice,” featuring free skating and DJ sets. Every Saturday night from 8:00 PM until 11:00 PM, skate under the stars to music from a stellar lineup of the area’s best DJs. Bundle up, get outside, and enjoy the Toronto winter. Light up the cold and dark winter evenings at the annual Toronto Light Festival. 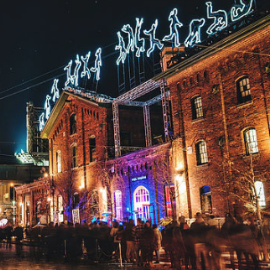 A newcomer to Toronto’s festival scene, Toronto Light Festival’s first edition in 2017 was a smashing success, and the festival is returning in 2018 to transform the Distillery Historic District into a massive open-air art gallery. View dozens of compelling illuminated works by local and international light artists on display throughout the neighbourhood. Stroll through this historic neighbourhood and enjoy these stunning light displays during the coldest nights of the season. Best of all, the entire festival is free and open to the public. For fashionistas, the Royal Ontario Museum is a must-visit this January. Celebrating the seventieth anniversary of the iconic House of Christian Dior, the ROM’s special exhibit, Christian Dior, features a selection of breathtaking Dior designs. Focusing on the first ten years of Christian Dior haute couture, 1947 to 1957, the exhibit offers captivating insights into the creative process and mechanics of the fashion industry in post-World War II Paris. Explore this stunning exhibit featuring everything from daytime to evening wear for grand occasions, drawn from the ROM’s extensive collection of textiles and fashions, which is the largest in Canada and ranks among the top three the world.